We had great news on 30th September 2018! The Mary Boast Prize, which is organised by the Camberwell Society, has been won by an essay from some of the Friends of Burgess Park ‘Zeppelin 1917’ team. A big thank you to all the volunteer authors including the essay editing team of Judith Barratt, Joan Ashworth and Susan Crisp. 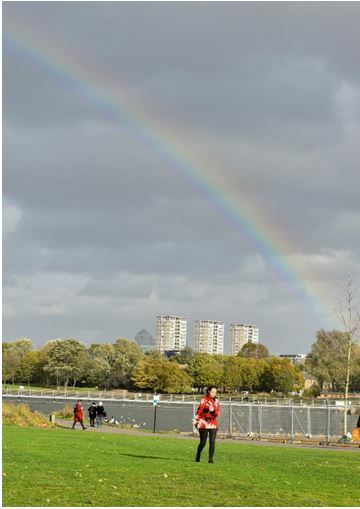 The prizewinning essay, which you can read here, tells the story of the 1917 Zeppelin raid on the park, covered on this website, and also the events organised by the Friends of Burgess Park to commemorate the terrible occasion. 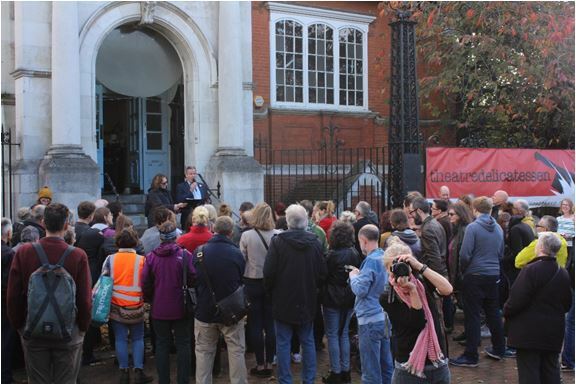 The winner was announced at the end of a fascinating local history walk around Burgess Park and the surroundings, and covered some of the planned new developments to the area. The essay is based on work done in 2017 by many volunteer researchers who joined with members of the Friends to investigate the events of 1917 with the help of a Heritage Lottery Fund grant. All kinds of information was uncovered with the help of nearby archives such as the Southwark Local History Archive, the Imperial War Museum and the Cuming Museum collection. At the special events organised to commemorate the centenary in October, we were honoured by the presence of several close members of the two families who lost the biggest number of relatives in the bombing. We were able to add their information to the essay. The Camberwell Society’s annual prize is named after Mary Boast, who was a popular local historian and the archivist at the Southwark Local History Library and Archives. 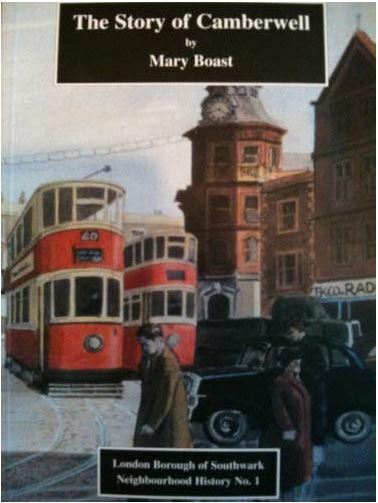 She wrote the excellent history booklet – The Story of Camberwell, and has a street named after her. You’ll be able to read the essay in full in the Camberwell Quarterly magazine, to be published by Christmas 2018. Order your copy now! 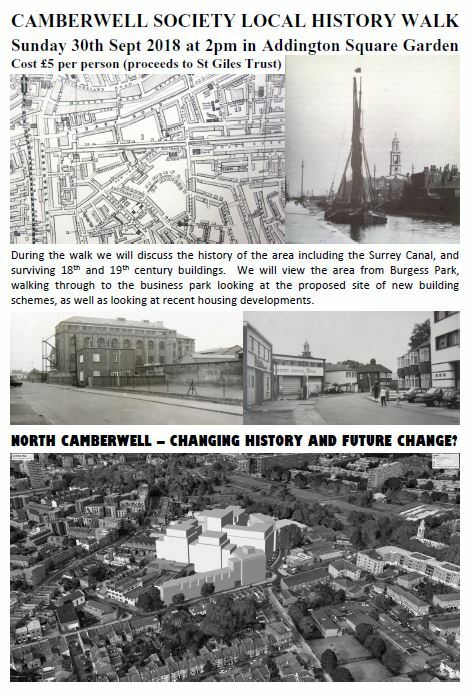 Or join the Camberwell Society and have it sent to your house for free! Or buy it in any local shop, if you’re in the area. Or read it now! 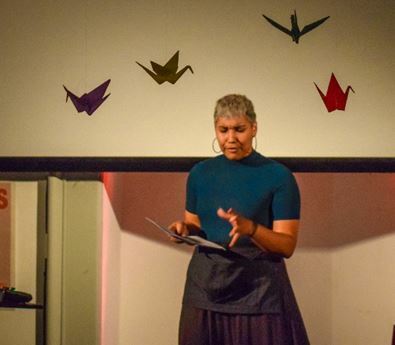 Scratch Night at Theatre Delicatessen is an evening of variety, ideas and fun; a chance to see artists present brave, new work at the first stages of development. 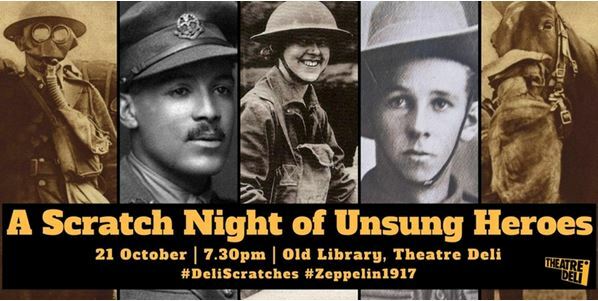 The four performances brought a real insight into the impact of WWI and how it affected the lives of people at home. A new spoken-word performance – Anonymous Is A Woman – kicked off the evening. 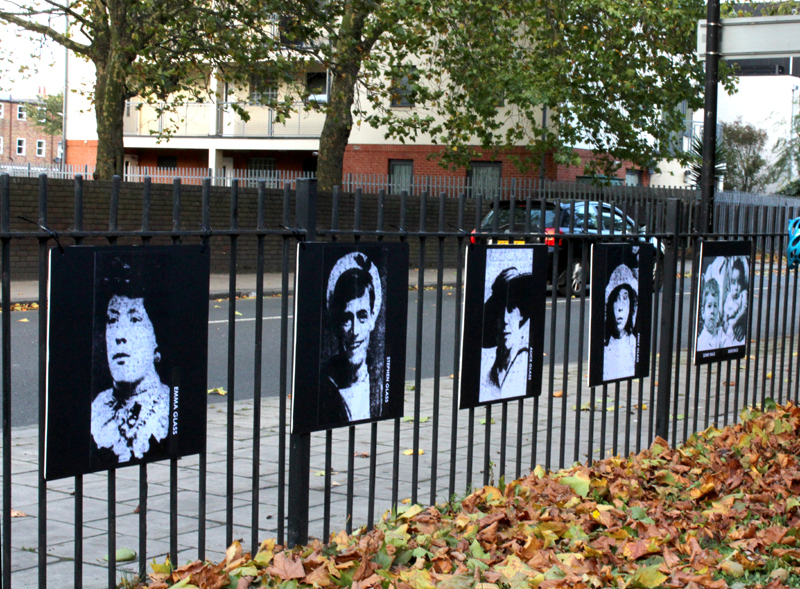 Reflecting on the life of a young women who could have known the families from Calmington Road, the poem by Koko Brown, in collaboration with director Tania Azevedo, compared local domestic life with the extraordinary news about Mata Hari who was shot as a spy on 15th October 1917. Two of the scratch theatre pieces performed material written during the war. The Way To Win, from 1915, was a recruiting piece which toured through music halls across the country. It pulls all the patriotic strings to encourage young men to sign-up, to gain respect and love from family and friends. The second, God’s Outcast, a sombre piece from 1918, shows a heartbroken father and a young wife who have each lost a young man to the war. Meeting in a railway station waiting room they confide how much the loss means and how they cannot bear to continue to live. The contrast between the two plays is stark. On a brighter note, We Have Been Gloriously Happy, written and performed by Beth Watson and Sadie Clark, presented a series of dialogues showing the new roles that women were taking on: suffragettes setting up local committees to support the war effort; women taking on the medical profession and establishing field hospitals; and munitions workers wondering what the future would hold once the men returned and took back the jobs after the war. 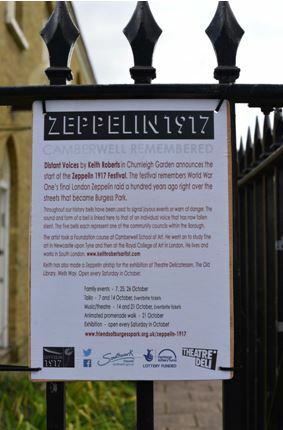 The performers had access to all our research about WWI and the lives of local people in south east London, especially Camberwell, where the Zeppelin air raid took place in October 1917. 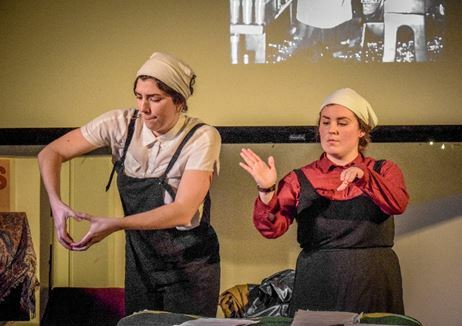 Theatre Delicatessen’s knowledge of new writers and performers brought these stories to life, showing the social impact of WWI to a new audience. Along with over 60 others, I set out on the afternoon of Saturday 21st October for a breezy walk around Burgess Park, to find out more about what happened 100 years ago on Friday 19th October 1917, when the Zeppelin bombing raid struck over Walworth, South-east London. 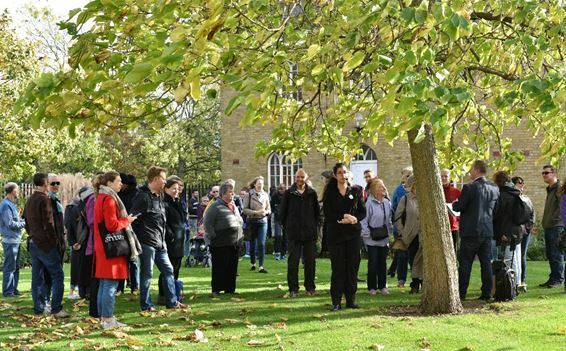 The event took the shape of an animated walk – the narrator guides walkers around significant points in the park where actors play out the voices of people caught up at the time of the Zeppelin strike. If you missed the event itself, an audio version will be available soon as a podcast. John Whelan, the project lead, narrated the events, and one of the first things we learned was that the weather was very similar on that night, with a heavy, gusting wind that meant the Zeppelins were not heard until they were almost overhead – the Silent Raid. The first ‘Voice from the Past’ was the Zeppelin commander, Kapitänleutnant Waldemar Kölle, who gave an account of the long flight from Germany. The Zeppelin flight was affected by the wind, getting blown off course – they were aiming for the northern industrial city of Sheffield – and had to climb higher into the freezing atmosphere to avoid gunfire from British planes. Kölle praised his gallant crew who were frozen and tired yet stayed at their posts – but it was hard to see what alternative they had! Eventually, after crossing London and dropping it’s bombs, on its way back to base, the Zeppelin ran out of fuel, crash-landimg in France where the crew were taken prisoners of war. We heard more Voices from the Past – some of the people involved in the war effort: the so-called Canary Girls, whose skin and hair turned yellow due to the chemicals they were working with in the munitions factories; the newly-introduced air-raid warden – issued with a whistle to warn people to take cover! And from the reporter restricted in what could be published by the all-encompassing ‘Defence of the Realm Act’ (DORA). … and also rain, as we heard the Voices from the Past of distinguished visitors who came to see the bomb-site at Calmington Road and talk to the survivors, no less than the Prime Minister of day, David Lloyd George and their majesties King George V and Queen Mary. At one point there was a rainbow, symbol of hope, as we walked from one location to another. The most poignant part of the walk for me, was when we reached the actual spot where the bomb fell, at what used to be the junction of Calmington Road with Albany Road. The photographs of the victims on the railings and the sad stories of those who died, those who survived but lost children, or were affected for the rest of their lives, really brought home the grim reality of civilian deaths in wartime. One of the most moving aspects of the whole project was the involvement of the families of the victims and survivors of the bombing raid. We were able to meet with the siblings and descendents of both the Balls family, who lost two members, and the Glass family, who lost four. Greta and Peter, younger sister and brother of Eddie and Sonny Balls (pictured far right on the railings above) attended the opening of the season on 7th October (see report here). Barbara, daughter of Jesse Glass and granddaughter of Emma Glass (pictured far left, above) attended both the opening and the animated walk, travelling with members of her family to London from St Leonards. 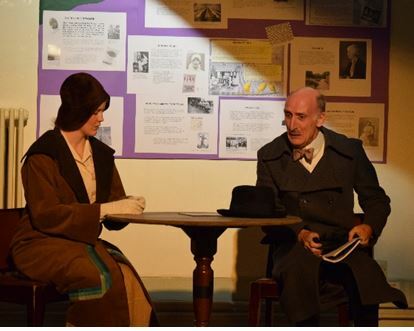 Well done to John Whelan and all the actors and project volunteers who put together a vivid and moving portrayal of the events of the Zeppelin raid 1917. If you missed the walk itself, the soundtrack will be available shortly as a podcast for download or listening online. Please visit our newly-launched podcast pages now to listen to our archive of previous talks, and if you subscribe to the series in your podcast app (for free), you’ll receive the new Zeppelin episode automatically (as well as any episodes in the future) as soon as it’s published in the next few weeks. Posted by Helen Crisp, 26th October 2017; additional details, 15th November. How big is a Zeppelin? In order to answer that question the Burgess Park Cricket Club helped lay out the size of Zeppelin L45 onto the park on Saturday morning using their boundary rope. In fact, we discovered the Zeppelin size is larger than a cricket pitch boundary! 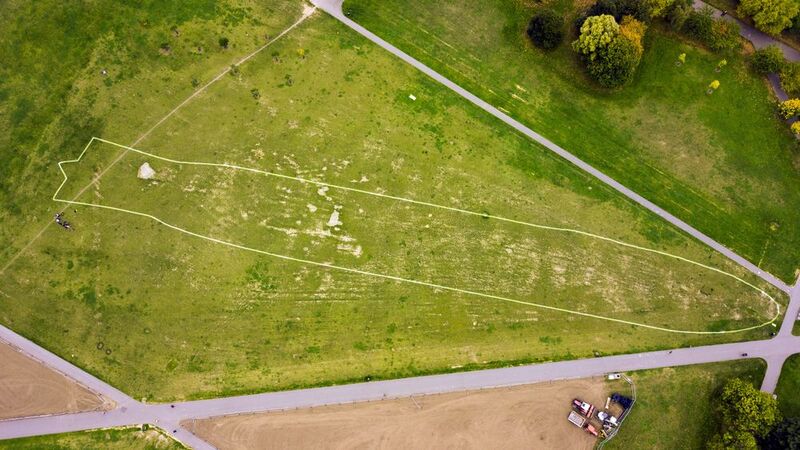 This aerial photograph, thanks to Damian Laurence’s drone piloting, shows the Zeppelin taking up the whole of the great lawn – as long as a street. 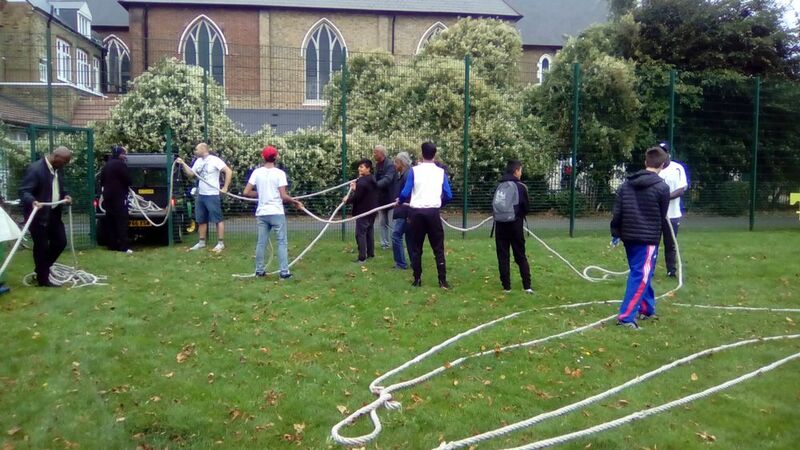 Many thanks to Everton for organising this with the cricket club, and to Jo and Lewis from Southwark Parks for helping to move the huge amount of rope. 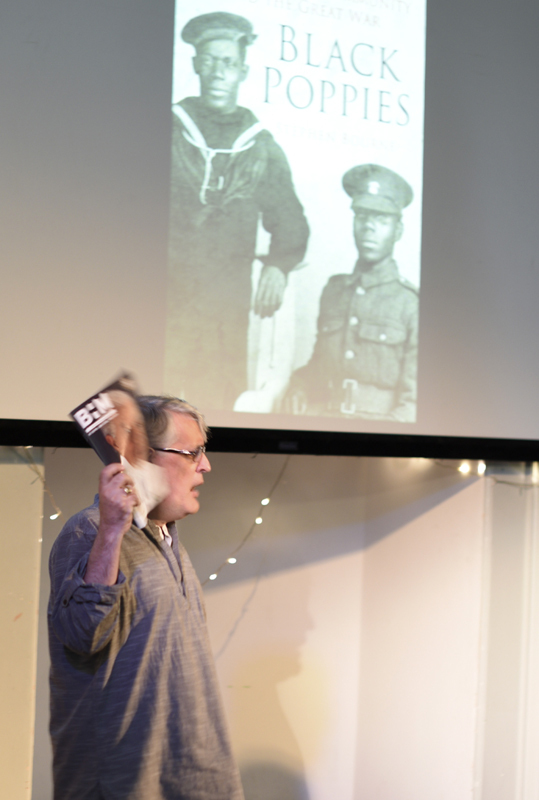 On Saturday afternoon local historian and author Stephen Bourne gave a presentation telling the story of how black people in Britain joined up for the forces and played a variety of roles in WWI. Unlike the USA, Britain did not segregate servicemen by colour. 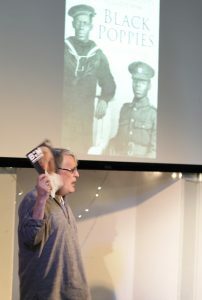 Stephen showed photographs from different regiments with black servicemen and explained the social history of black people as part of local communities in the UK prior to WWI. As the war progressed more forces were also drawn from the colonies and came to fight in Europe. Stephen’s book Black Poppies gives plenty of detail on the military and civilian wartime experience of black Britons, from the trenches to the music halls. 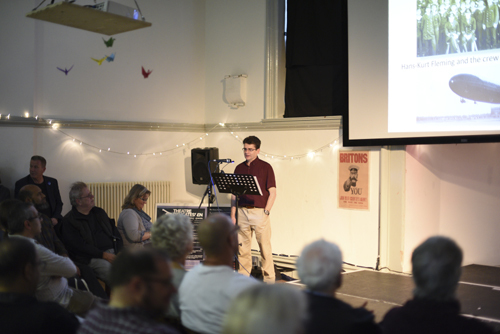 Stephen concluded his talk by outlining his research into the role of the police during the Zeppelin air raid on Calmington Road. The police officers who rescued people from the damaged buildings were all awarded medals. The role of the police as hidden heroes is recognised in the Zeppelin 1917 exhibition. So quite a lot of social pressure to join-up! 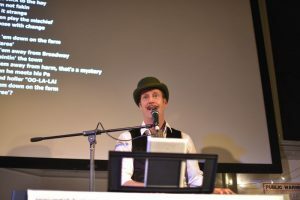 We rounded up the with an evening with quizmaster extraordinaire Mike Raffone and a proper singalong from Mister Meredith (both sporting excellent moustaches). 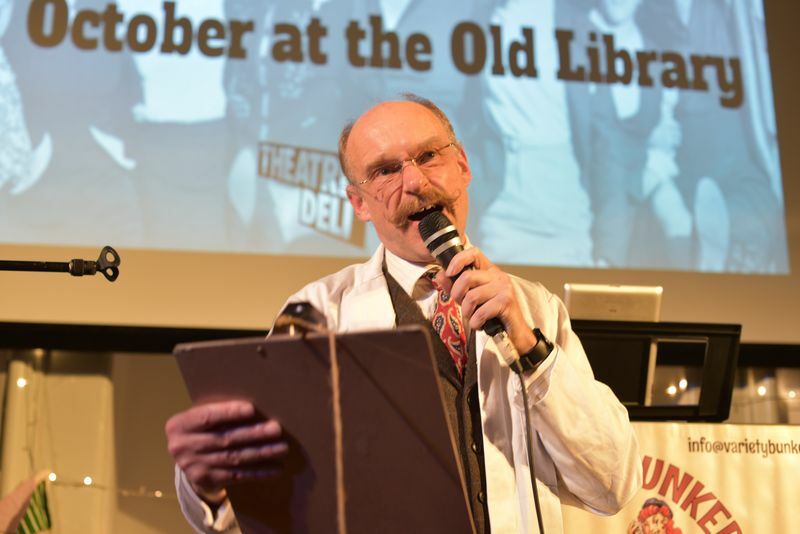 With several competitive quiz teams, including some of our volunteer researchers, as well as Glengall Wharf Garden and other local volunteers, the standard was high on the local knowledge, but less sure on the famous singers of the period. 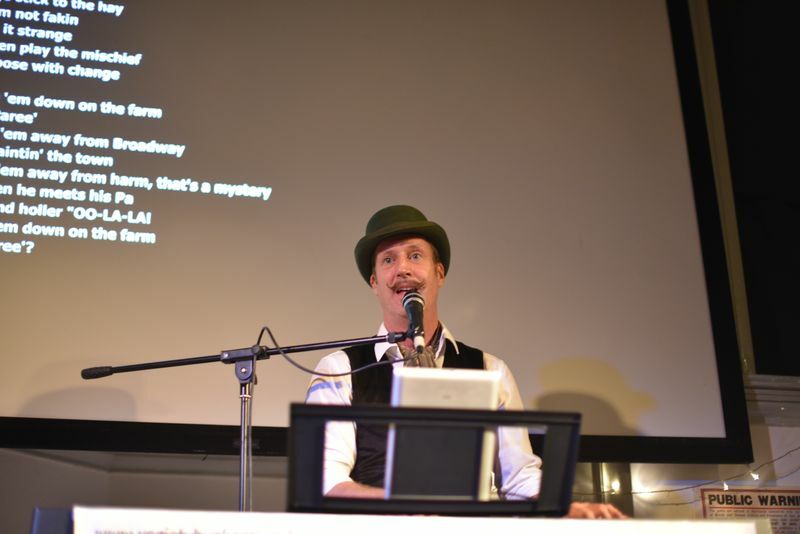 Mister Meredith then took us through some well-known songs of the period – recruiting songs and music hall numbers – with the official words, and sometimes the soldiers’ own versions of the songs! Q: Who composed “Keep the Home Fires Burning” ? The day before saw the arrival of our amazing Zeppelin art piece, specially built by Keith Roberts for the Zeppelin 1917 season. After “flying through” Burgess Park, the artwork was carefully hoisted into place by Jon and Keith. What an excellent way to kick off our launch. Keith has also contributed another artwork to embellish our project – Silent Voices, which can be seen in Chumleigh Gardens, opposite the First World War memorial stone. The day began in a flurry of good-natured activity fuelled by tea and biscuits. Massive thanks to all the hardworking exhibition installation volunteers (Jon, Andrew, Monica, Chris, Susan, Catriona, Judith, Charlie, Mercy and John) who worked tirelessly on both days (Friday till 10pm!) to get the TheatreDeli exhibition up and ready for the opening at 1pm. Wonderful teamwork. and it looks incredible! Whist the exhibition setup was finished, over 50 parents and children enjoyed “Flying Designing” at the Fun Palace with hands-on workshops to make a Zeppelin, design a rocket and create a paper bird and flowers. Great excitement ensued when rockets were launched outside using plastic bottles, water and air pressure. 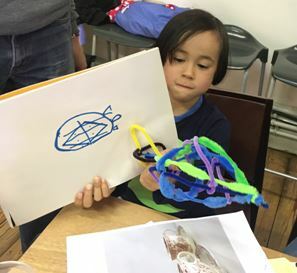 Thanks go to Florence Goodhand-Tait for running the workshop with Art in the Park, Alice Sheppard, Citizen Science and Sue Smith, Camberwell Arts. 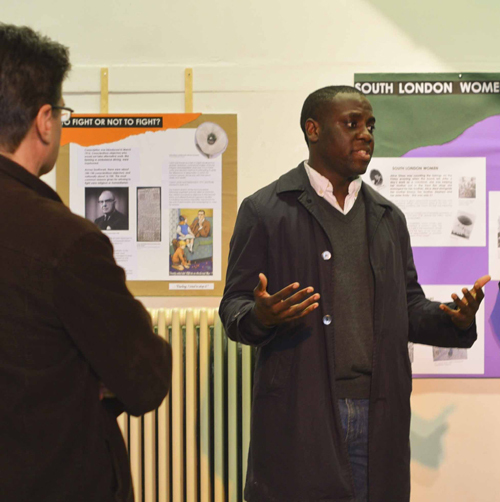 The exhibition was then was formally opened by Councillor Johnson Situ, who was introduced by Susan Crisp, chair of the Friends of Burgess Park. Later in the afternoon we were honoured to host members of the two families at the heart of our project – descendants of the Balls and Glass families. 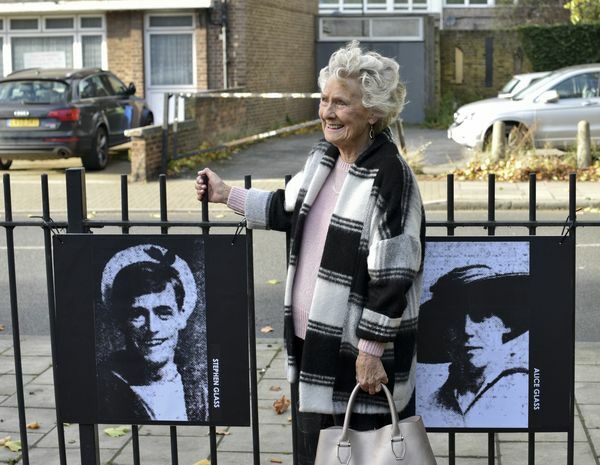 The Boyce/Balls family includes Mrs Greta Druce (102 years old next month), who actually survived the raid, although, tragically Greta’s two brothers Eddie and Sonny Balls died and brother Leslie never recovered from the trauma. 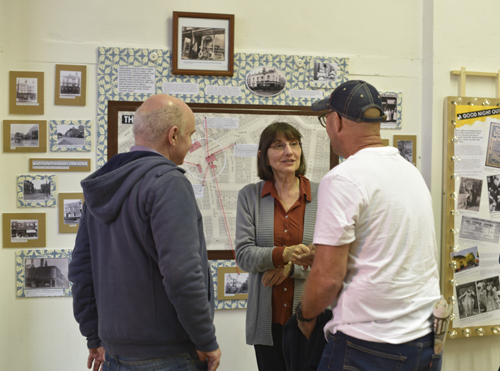 We also loved chatting to John and Barbara Shaw (up from the south coast) and Mark Draper (down from Crewe) all relatives of the Glass family – who lost 4 members that night. At 4pm, Ian Castle gave a fascinating talk on ‘The Silent Raid’. The talk, illustrated with vivid images, was dramatic, touching, and funny at times. Above all, what Ian gave us was an evocative journey through the mind-set of the Zeppelin commanders and the damage they did to ordinary people and even to their own crews. Warm thanks are due to our gallant speaker Ian Castle and his partner Nicola Price who overcame many obstacles to be with us. It was especially poignant to hear from the family members during the talk Q&A. It brought home what life was like for bombing victims – no one in the room could fail to truly understand the human cost of war. Special thanks to John Whelan who has kept us on a steady course, coordinating the researchers and the fantastic volunteer sessions with our supporting partner organisations. 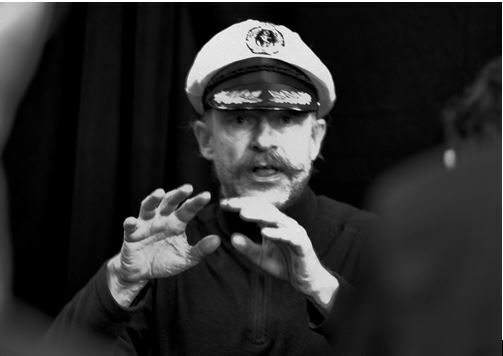 John, will of course, be leading the Animated Walk on 21st October 2-4pm (meet at TheatreDeli), which promises to be a fitting coming together of all the research and experiences we have painstakingly gathered. I personally can’t wait for this experience! The exhibition can be seen on Saturdays through October, and especially at our next talk ‘Black Poppies’, on the black community in WW1. On Saturday 14th, given by Stephen Bourne – book now! 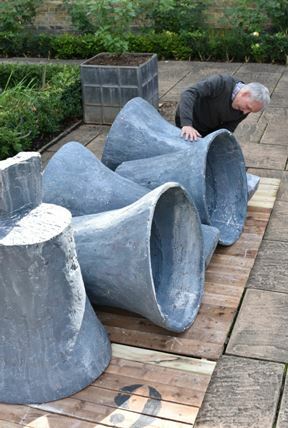 Local artist Keith Roberts, who has a keen interest in the First World War, installed his sculpture Silent Voices in Chumleigh Gardens this week. 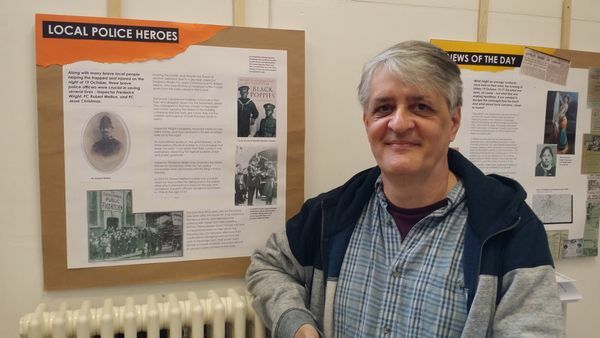 Keith has exhibited a similar piece in the exhibition ‘War in the Sunshine: The British in Italy 1917-1918’ at the Estorik Collection in Highbury earlier this year. 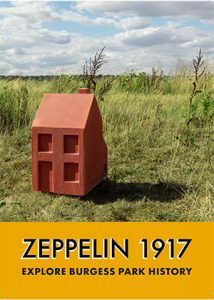 We are delighted he has chosen to show this work here during Zeppelin 1917. Many cups of tea and coffee from Parklife Café were consumed during the installation and there was lots of interest from regular visitors to the lovely English garden. 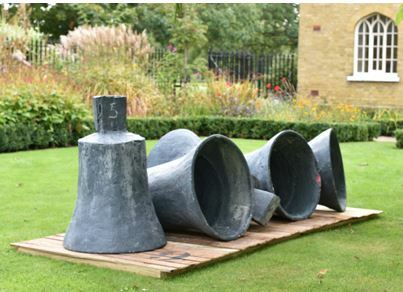 Sadly the bells can’t go on the lawn but are instead looking equally amazing nearby on the broad central pathway. A word of thanks to the park’s staff who were so helpful on the day. 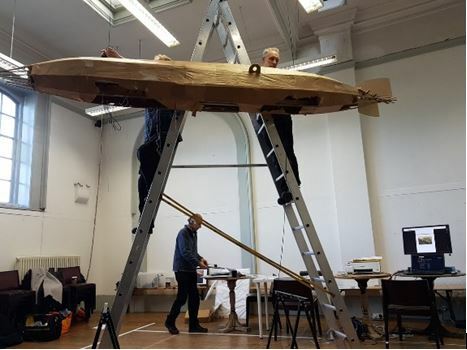 Keith has also made a Zeppelin to hang in the exhibition at Theatre Delicatessen and there is a plan being hatched to film its journey from his studio through the park to the Old Library on 6th October. Watch this space…. Check out all the other Zeppelin happenings this October! You can also volunteer to help us! 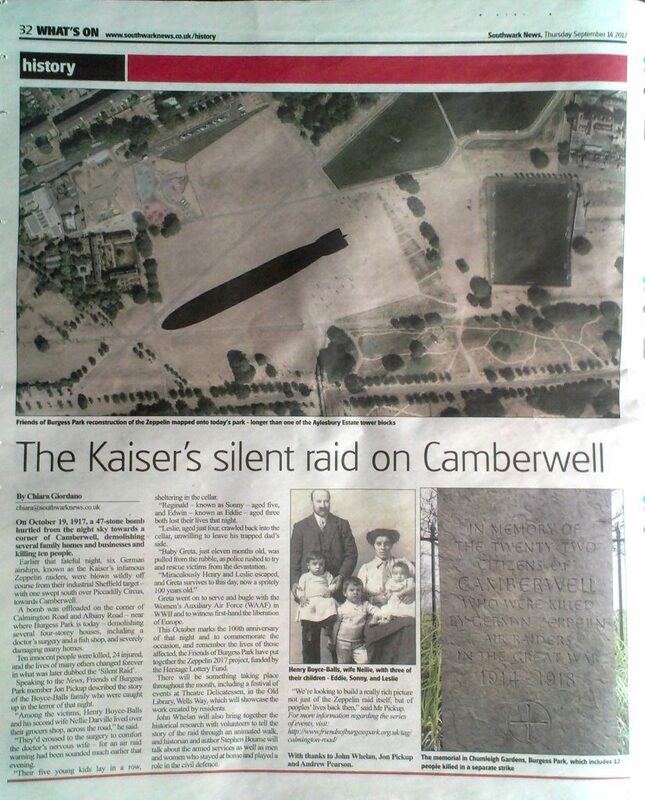 On 14th September, Southwark News published a second article on our remembrance of the 1917 Zeppelin raid on Camberwell. 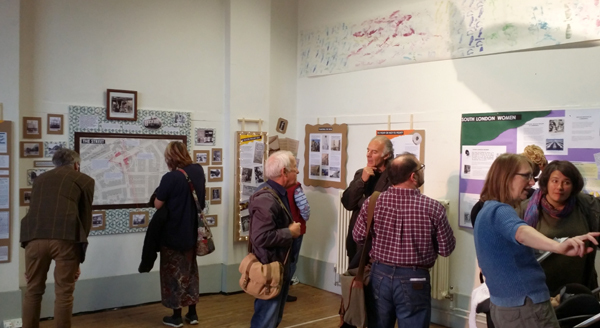 The article covered the story of the Boyce-Balls family who Jon Pickup and Andrew Pearson, volunteers on the Friends of Burgess Park Zeppelin research project, met recently. They spoke to Greta and Peter, younger siblings of the two brothers killed in the raid. Peter described how their family had crossed the road from their father’s grocers shop to be with the doctor’s wife who was nervous in air raids, on the night of 19th October, 1917. The surgery and surrounding houses were subsequently hit by the Zeppelin bomb.